Apartment in the center of Rome a few steps from the Vatican! The area is developed around a historical axis of fundamental importance for Rome: the Roman Basilica of San Pietro, Castel Sant'Angelo and Piazza del Popolo. On foot you can reach all the main Roman sites. The exclusive Prati district offers a wide choice of restaurants, pubs and shops including the new "COIN-Excelsior" shopping center where you can find the most famous Made in Italy brands and many others. A splendid garden "La Mola Adriana" stands in the shadow of Castel Sant'Angelo. With a walk you can reach the park of Villa Borghese located in the heart of Rome. In the neighborhood there are the famous shopping streets: via Candia via Ottaviano and via Cola di Rienzo, streets full of shops, cafes, restaurants and pubs. A few meters from the apartment is the subway with the Ottaviano stop, while in the nearby Piazza Risorgimento are the terminus of the taxis and the area is developed around a historical axis of fundamental importance for Rome: the Roman Basilica of San Pietro, Castel Sant'Angelo and Piazza del Popolo. On foot you can reach all the main Roman sites. In the neighborhood there are the famous shopping streets: via Candia via Ottaviano and via Cola di Rienzo, streets full of shops, cafes, restaurants and pubs. A few meters from the apartment is the subway with the Ottaviano stop, while in the nearby Piazza Risorgimento are the terminus of taxis and under the house there is a bus stop between which 70 to the Fori Imperiali and the Colosseum. Giorgio was so nice and helpful upon our arrival. He was a great resource for information about surrounding sites and restaurants. This apartment was located in a quiet area of town and right across the street from a nice grocery store. It was pretty close to a metro and walking distance to the stadium for soccer games. We were not there long, but it was comfortable and clean for our family of 5. They arranged transport back to the airport for us which was very helpful. Thank you. Giorgio was very helpful when we first arrived to show us the neighborhood and on a map essential items such as the closest grocery store. He gave great information on good local restaurants, best ways to reach points of interest and was very communicative leading up to our trip. FYI, the restaurant right next to the apartment is wonderful! If you are planning on using the washer, make sure he goes over how to use the machine. He did for us and it was very helpful. Great host and we would definitely stay there again. In a quiet area,but only 10 minutes walk from the Vatican. Clean,comfy beds. Owner very helpful. Stayed 4 nights, great local restaurants.Easy access to all of Rome.Close to supermarket which makes life easy for the stuff you need for self catering. Having a taxi arranged by Giorgio to pick us up and drop us off at the airport worked really well. Very nice apartment! Short walk to Vatican!! We stayed for almost 3 weeks in this comfortable apartment at 10 minutes walk from the Vatican. 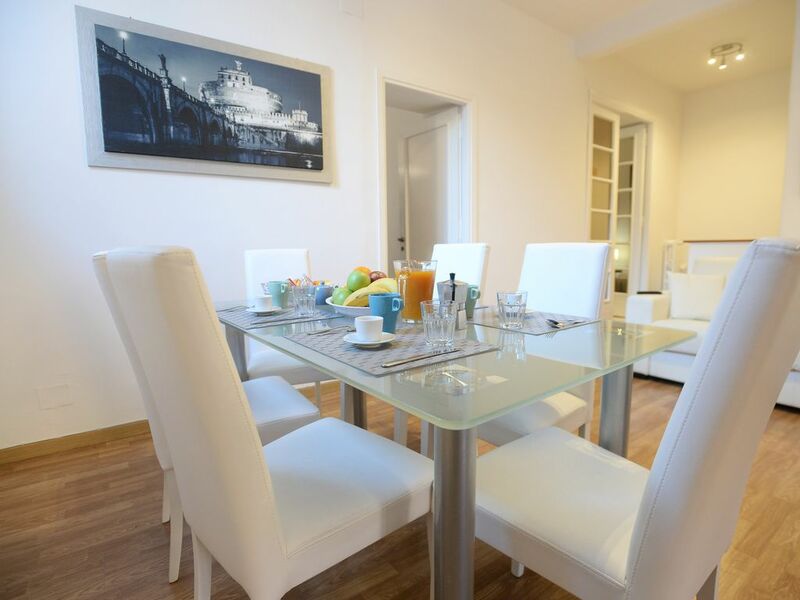 The apartment is light, cosy, well equiped and also at walking distance from the old town (appr. 30 minutes). There is a bus stop virtually in front of the door with bus lines 23 and 70 taking you in 10 to 15 minutes to the Tiber Island/Trastevere or Piazza Venezia. There is a large supermarket at 3 minutes walking and plenty of restaurants and bars. The area is a mixture of offices and classical apartment buidings from the 1920/30's, safe and clean. There is the real Italian city life with few tourists around. The owner Giorgio is a very nice chap, who is living at some minutes walking distance from the apartment, speaks good English and made us feel welcome. At arrival he took plenty of time to explain things, and when we had a small technical problem he came over within some minutes to solve it for us. City maps of Rome and a pair of additional keys were provided. During our stay the apartment was cleaned once or twice without charging additional costs. In brief, this apartment is very suitable for those who want to be comfortable, not in the middle of groups of tourists and still at walking distance from everything. We stayed almost 3 weeks, but for shorter stays it is also suitable. Highly recommended, we hope to come back to this place some time. We spent two weeks traveling in Europe, and this was, by far, the best place we stayed! Giorgio was the perfect host, taking the time to go over the area, and making recommendations for restaurants, etc. We look forward to coming back to Rome, and we’ll definitely stay here again! I can’t recommend Giorgio’s place enough!